"Fresh mushrooms, light sour cream and less butter give Donna's classic stroganoff recipe a healthier twist. Be sure to serve over whole wheat noodles!" Remove any fat and gristle from the roast and cut into strips 1/2-inch thick by 2-inches long. Season with 1/2 teaspoon salt and 1/2 teaspoon pepper. Melt 1 tablespoon butter in a large skillet over medium heat. Add mushrooms and green onions and cook, stirring occasionally, until mushrooms are browned, about 6 minutes. Remove to a bowl and add 1 tablespoon butter to the skillet. Cook and stir one half the beef strips until browned, about 5 minutes, then remove to a bowl. Repeat with the remaining butter and beef strips. Pour wine into the hot skillet and deglaze the pan, scraping up any browned bits. Combine flour and 1/4 cup beef broth in a jar with a tightly fitting lid and shake until combined. Stir into the skillet, whisking until smooth. Stir in the remaining broth and mustard, then return the beef to the pan. Bring to a simmer. Cover and simmer until the meat is tender, about 1 hour. Stir in the prepared mushrooms and the sour cream five minutes before serving. Heat briefly and season with salt and pepper. 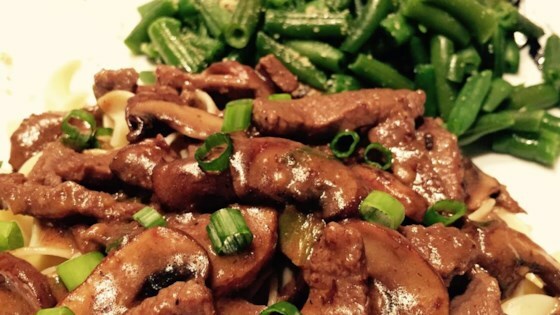 This recipe is a healthier version of Beef Stroganoff III. Realy good. Really easy. Even my picky 3 yr old ate his. Thanks! Nice flavor but next time I will cut up a slow cooked roast for more tender beef.